The sky looked just like this in real life one day last week and immediately the phrase ‘Red sky at night, Shepherd’s delight, red sky in morning, Shepherd’s warning’ came to mind. On that occasion it didn’t turn out to be a terrible day weather wise and I’ve never been convinced by the morning red sky warning though the red sky at night is often a good indicator of the forthcoming, next day weather. I suppose if you believe in one you should believe in the other? But, I’m just rambling now. I’ve been wanting to take this photo since I saw this boat and the puffin island at the set up for Flourish. I’m not logged in SL to check at the moment but off the top of my head I believe both items are priced at only 99L$ (it’s definitely no more than that as the cap for pricing at the event is 99L$). The Puffin Island comes with the rocks and puffins but also with a separate Puffin for decor purposes. 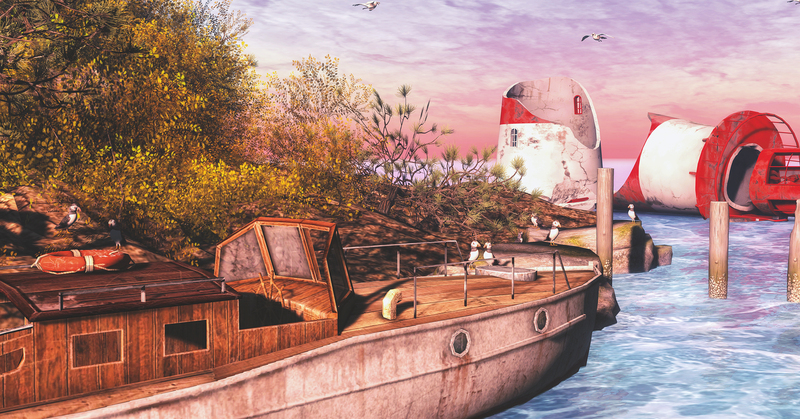 The boat from B-Made is static and non-driveable but packed with male and female animations and is an amazing decor item for decorating a sim or taking photos! Flourish is open until the 4th May.